These highlights do not include all the information needed to use MOXEZA ® solution safely and effectively. See full prescribing information for MOXEZA ®. To report SUSPECTED ADVERSE REACTIONS, contact Alcon Laboratories, Inc. at 1-800-757-9195 or FDA at 1-800-FDA-1088 or www.fda.gov/medwatch. *Efficacy for this organism was studied in fewer than 10 infections. Instill 1 drop in the affected eye(s) 2 times daily for 7 days. 4 mL bottle filled with 3 mL of sterile ophthalmic solution of moxifloxacin 0.5%. NOT FOR INJECTION. MOXEZA® solution is for topical ophthalmic use only and should not be injected subconjunctivally or introduced directly into the anterior chamber of the eye. In patients receiving systemically administered quinolones, including moxifloxacin, serious and occasionally fatal hypersensitivity (anaphylactic) reactions have been reported, some following the first dose. Some reactions were accompanied by cardiovascular collapse, loss of consciousness, angioedema (including laryngeal, pharyngeal or facial edema), airway obstruction, dyspnea, urticaria, and itching. If an allergic reaction to moxifloxacin occurs, discontinue use of the drug. Serious acute hypersensitivity reactions may require immediate emergency treatment. Oxygen and airway management should be administered as clinically indicated. As with other anti-infectives, prolonged use may result in overgrowth of non-susceptible organisms, including fungi. If superinfection occurs, discontinue use and institute alternative therapy. Whenever clinical judgment dictates, the patient should be examined with the aid of magnification, such as slit-lamp biomicroscopy, and, where appropriate, fluorescein staining. Patients should be advised not to wear contact lenses if they have signs or symptoms of bacterial conjunctivitis. The data described below reflect exposure to MOXEZA® solution in 1263 patients, between 4 months and 92 years of age, with signs and symptoms of bacterial conjunctivitis. The most frequently reported adverse reactions were eye irritation, pyrexia and conjunctivitis, reported in 1-2% of patients. Pregnancy Category C. Moxifloxacin was not teratogenic when administered to pregnant rats during organogenesis at oral doses as high as 500 mg/kg/day (approximately 25,000 times the highest recommended total daily human ophthalmic dose); however, decreased fetal body weights and slightly delayed fetal skeletal development were observed. There was no evidence of teratogenicity when pregnant Cynomolgus monkeys were given oral doses as high as 100 mg/kg/day (approximately 5,000 times the highest recommended total daily human ophthalmic dose). An increased incidence of smaller fetuses was observed at 100 mg/kg/day. Since there are no adequate and well-controlled studies in pregnant women, MOXEZA® solution should be used during pregnancy only if the potential benefit justifies the potential risk to the fetus. Moxifloxacin has not been measured in human milk, although it can be presumed to be excreted in human milk. Caution should be exercised when MOXEZA® solution is administered to a nursing mother. The safety and effectiveness of MOXEZA® solution in infants below 4 months of age have not been established. There is no evidence that the ophthalmic administration of moxifloxacin has any effect on weight bearing joints, even though oral administration of some quinolones has been shown to cause arthropathy in immature animals. No overall differences in safety and effectiveness have been observed between elderly and younger patients. MOXEZA® is a sterile solution for topical ophthalmic use. Moxifloxacin hydrochloride is an 8-methoxy fluoroquinolone anti-infective, with a diazabicyclononyl ring at the C7 position. Chemical Name: 1-Cyclopropyl-6-fluoro-1,4-dihydro-8-methoxy-7-[(4aS,7aS)-octahydro-6H-pyrrolol[3,4-b]pyridin-6-yl]-4-oxo-3-quinolinecarboxylic acid, monohydrochloride. Each mL of MOXEZA® solution contains 5.45 mg moxifloxacin hydrochloride, equivalent to 5 mg moxifloxacin base. Inactives: Sodium chloride, xanthan gum, boric acid, sorbitol, tyloxapol, purified water, and hydrochloric acid and/or sodium hydroxide to adjust pH. MOXEZA® is a greenish-yellow, isotonic solution with an osmolality of 300-370 mOsm/kg and a pH of approximately 7.4. Moxifloxacin hydrochloride is a slightly yellow to yellow crystalline powder. Moxifloxacin is a member of the fluoroquinolone class of anti-infective drugs [see Clinical Pharmacology (12.4)]. Moxifloxacin steady-state plasma pharmacokinetics were evaluated in healthy adult male and female subjects who were administered multiple, bilateral, topical ocular doses of MOXEZA® solution two times daily for four days with a final dose on day 5. The average steady-state AUC0-12 was 8.17 ± 5.31 ng*h/mL. Moxifloxacin Cmax following twice-daily bilateral ophthalmic administration of moxifloxacin 0.5% for 5 days is approximately 0.02% of that achieved with the oral formulation of moxifloxacin hydrochloride (Cmax following oral dosing of 400 mg AVELOX*, 4.5 ± 0.5 mcg/mL). The antibacterial action of moxifloxacin results from inhibition of the topoisomerase II (DNA gyrase) and topoisomerase IV. DNA gyrase is an essential enzyme that is involved in the replication, transcription and repair of bacterial DNA. Topoisomerase IV is an enzyme known to play a key role in the partitioning of the chromosomal DNA during bacterial cell division. The mechanism of action for quinolones, including moxifloxacin, is different from that of macrolides, aminoglycosides, or tetracyclines. Therefore, moxifloxacin may be active against pathogens that are resistant to these antibiotics and these antibiotics may be active against pathogens that are resistant to moxifloxacin. There is no cross-resistance between moxifloxacin and the aforementioned classes of antibiotics. Cross-resistance has been observed between systemic moxifloxacin and some other quinolones. In vitro resistance to moxifloxacin develops via multiple-step mutations. Resistance to moxifloxacin occurs in vitro at a general frequency of between 1.8 x 10-9 to < 1x10-11 for Gram-positive bacteria. The following in vitro data are available, but their clinical significance in ophthalmic infections is unknown. The safety and effectiveness of MOXEZA® solution in treating ophthalmic infections due to these organisms have not been established in adequate and well-controlled trials. Moxifloxacin has been shown to be active in vitro against most strains of the microorganisms listed below. These organisms are considered susceptible when evaluated using systemic breakpoints; however, a correlation between the in vitro systemic breakpoint and ophthalmologic efficacy has not been established. The list of organisms is provided as guidance only in assessing the potential treatment of conjunctival infections. Moxifloxacin exhibits in vitro minimal inhibitory concentrations (MICs) of 2 mcg/mL or less (systemic susceptible breakpoint) against most (≥ 90%) strains of the following ocular pathogens. Long-term studies in animals to determine the carcinogenic potential of moxifloxacin have not been performed. Moxifloxacin was not mutagenic in four bacterial strains used in the Ames Salmonella reversion assay. As with other quinolones, the positive response observed with moxifloxacin in strain TA 102 using the same assay may be due to the inhibition of DNA gyrase. Moxifloxacin was not mutagenic in the CHO/HGPRT mammalian cell gene mutation assay. An equivocal result was obtained in the same assay when v79 cells were used. Moxifloxacin was clastogenic in the v79 chromosome aberration assay, but it did not induce unscheduled DNA synthesis in cultured rat hepatocytes. There was no evidence of genotoxicity in vivo in a micronucleus test or a dominant lethal test in mice. Moxifloxacin had no effect on fertility in male and female rats at oral doses as high as 500 mg/kg/day, approximately 25,000 times the highest recommended total daily human ophthalmic dose. At 500 mg/kg orally there were slight effects on sperm morphology (head-tail separation) in male rats and on the estrous cycle in female rats. In one randomized, double-masked, multicenter, vehicle-controlled clinical trial in which patients with bacterial conjunctivitis were dosed with MOXEZA® solution 2 times a day, MOXEZA® was superior to its vehicle for both clinical and microbiological outcomes. Clinical cure achieved on Day 4 was 63% (265/424) in MOXEZA® solution treated patients, versus 51% (214/423) in vehicle treated patients. Microbiologic success (eradication of baseline pathogens) was achieved on Day 4 in 75% (316/424) of MOXEZA® solution treated patients versus 56% (237/423) of vehicle treated patients. Microbiologic eradication does not always correlate with clinical outcome in anti-infective trials. 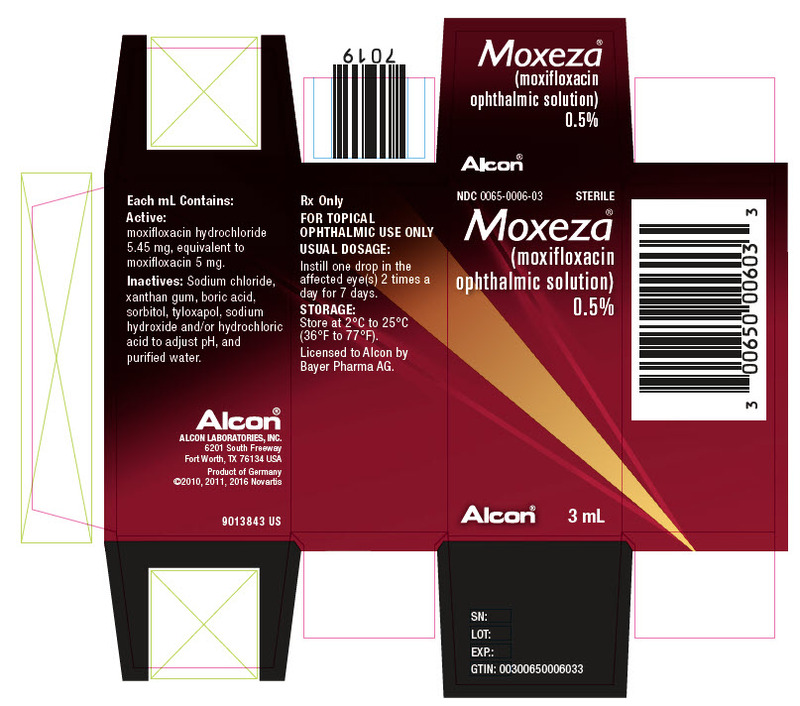 MOXEZA® solution is supplied as a sterile ophthalmic solution in the Alcon DROP-TAINER® dispensing system consisting of a natural low density polyethylene bottle and dispensing plug and tan polypropylene closure. Tamper evidence is provided with a shrink band around the closure and neck area of the package. Storage: Store at 2°C - 25°C (36°F - 77°F). Advise patients not to touch the dropper tip to any surface to avoid contaminating the contents. Advise patients not to wear contact lenses if they have signs and symptoms of bacterial conjunctivitis. Systemically administered quinolones, including moxifloxacin, have been associated with hypersensitivity reactions, even following a single dose. Patients should be told to discontinue use immediately and contact their physician at the first sign of a rash or allergic reaction. Licensed to Alcon by Bayer Pharma AG. *AVELOX is a registered trademark of Bayer AG.